Motor sport has some really awesome trophies. The winner of the Indy 500 gets the Borg Warner Trophy, a garish monstrosity nearly as high as – and much less dignified than – Allan McNish. When I was a student, my fellow Edinburgh Motor Sport Club members and I used to battle it out for such delights as the David Hale Memorial Trophy (a scale racing helmet on a solid silver base), the Wooden Spoon (a two-foot long wooden spoon), and a mysterious steel tankard by the name of Ken’s Third Mug. But in my view, the event with some of the best trophies of all is the RSAC Scottish Rally. For instance, every year, the rally’s unsung hero receives the Pentti Airikkala Trophy, which started out life as the trophy intended for the winning driver of the 1990 ‘national’ rally. Finnish world championship-level driver Airikkala was fastest through the stages that year by a considerable margin but refused to accept the trophy on the grounds that he was essentially testing a high-powered prototype car for Ford, instead requesting that the trophy be given annually to a member of the organising committee who had gone beyond the call of duty ‘behind the scenes’ to make the event run. The Scotsman Trophy, awarded annually to the top-ranking female driver, is perhaps best known of all among the Scottish rally community on account of its shape, about which I shall say no more here in the interests of common decency. It was thus with much delight that at the end of this year’s Scottish, I was asked to convey to Motoharu Kaseya and Kohei Izuno that they had been designated as the recipients of the 2013 Star of the Rally Award. The Japanese crew, for whom I had been coordinating media activities and interpreting all weekend long, had tackled the Dumfries and Galloway forest stages with good humour in the EuroRallye – K’s World Rally Team Honda Civic Type R, endearing themselves to officials, spectators and fellow competitors alike along the way. 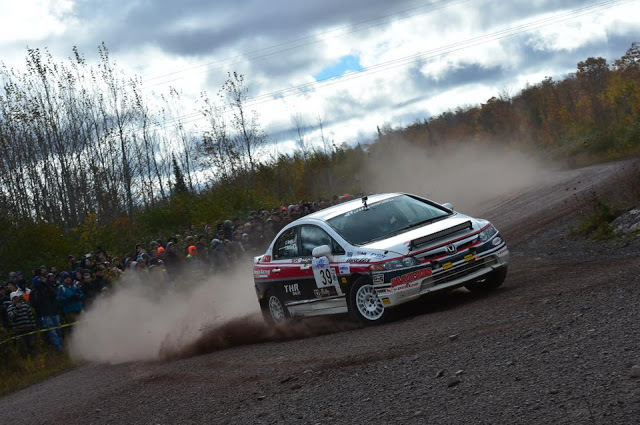 Taking into account that they had crossed continents, oceans and language barriers just to take part in the rally, Motoharu and Kohei’s solid drive to the finish was deemed the star performance of the day. What I was most delighted about was the fact the K’s team would have their names engraved on one of the historical trophies I was talking about above. For in addition to the two shiny silver stars they received to take back to Narita Airport in their suitcases, Kaseya-san and Izuno-san would have their names permanently etched into the silver of the Bandeath Trophy. At the time of presentation, I didn’t know much about the provenance of this trophy, other than that due to its slight patina and gently battered nature it must have been a few years old. That fact alone was enough to make the entire Japanese contingent grin from ear to ear – niyaniya suru – photos of the team with the trophy appearing on all sorts of blogs and websites over the following days and weeks. When I got back to the hotel that evening, I endeavoured to find out a bit more about the Bandeath Trophy in order to add a bit of colour to the press release. Onto Google I went, and was immediately confronted with a number of anti-capital punishment American websites. ‘Did you mean Ban Death?’ Google asked me in a somewhat patronising tone. ‘No I did not’, I answered sharply to the monitor as I repeated my search, this time placing quotation marks around the words. This yielded a slightly better piece of information. It turned out that in 2011, the Bandeath Trophy had been awarded to the Armed Forces Rally Team, the heroes of land, sea and air who keep the crowds entertained year on year with physics-defying feats in their fleet of white Land Rovers. Given how excited Team Principal Kazuya Suzuki had been when he saw the Land Rovers flying through the stages earlier that day, this was rather poignant. Still, it didn’t tell the whole story of where the award came from, so out went the press release stating simply that the Scottish officials had given the pair the historic Star of the Rally Award. I shut down the laptop and flaked out in bed. I may have collapsed with exhaustion, but despite having spent the best part of a week running an international rally, Clerk of the Course Jonathan Lord was still going strong right the way through Saturday night. I know this because when I turned my computer back on the next morning, an email from Jonathan – time-stamped with some ungodly hour – was waiting for me in my inbox. Not only was Jonathan conscious of my message coming in, he was also alert enough at 2am on Sunday to write me a potted history of the Bandeath Trophy. The Bandeath Trophy was presented to the RSAC Scottish Rally by Jonathan’s late father Gordon Lord in 1977, to be awarded annually to the Star of the Rally. It was named after the Royal Naval Armament Depot Bandeath, a munitions store on the banks of the River Forth to the east of Stirling of which Gordon Lord was Officer in Charge. The name ‘Bandeath’ also refers to Bandeath Lodge, the house in which the Lord family lived. Whilst the Bandeath Trophy itself stays with RSAC Motorsport, the winners each year are given an additional award to keep. Kaseya-san and Izuno-san apparently struggled to fit their personal Star of the Rally trophies, two big silver stars on plinths, into their suitcase. They may therefore be grateful to know they did not receive the rally’s more traditional Star of the Rally prize –sheepskin rugs. Two sheepskin rugs were traditionally provided by Jonathan’s parents for the winning crew, but with these kind of rugs going out of fashion in recent years it was decided to furnish the winners with trophies instead. I dread to imagine the scenes in the hotel room if a sheepskin rug had to be squeezed into the suitcase alongside a race suit, helmet and HANS device. The next weekend, I found myself hit with a pang of disappointment whilst watching the conclusion of the German Grand Prix. For what Messrs Vettel, Raikkonen and Grosjean received for succeeding in one of Europe’s historic motor races were three copies of the Santander banking group logo bolted on to a bit of wood. Follow in the footsteps of Nuvolari, Rosemeyer and Fangio, and get a portable advertisement for financial services you don’t need. Sheepksin rugs for the Stars of the Scottish Rally, though. Now there’s a real touch of class. Before the K’s World Rally Team came to Scotland, I told them that previous winners of the Scottish included Vatanen, Mikkola and McRae. Whilst the Scottish – and the whole rallying world – has changed drastically since those days, it was wonderful to see that Motoharu Kaseya and Kohei Izuno were able to return to Japan having added their own tiny footnote to the long and illustrious history of the RSAC Scottish Rally. Scene one. A Western-style steakhouse in suburban Tokyo. The air is thick with grease and smoke from the restaurant’s main product. Black-suited salarymen hunch over their tables, hacking away at juicy steaks with their knives and swilling food down with gulps of beer. Outside, commuter trains clatter past on the raised railway line, the horns from the expresses periodically interrupting the conversation. I should be enjoying a giant slab of meat and potato salad with my fiancée, but instead I’m watching my phone anxiously. Every time it vibrates, which is on average once every five minutes, my heart sinks because it means I have to either rack my brain to write a message in Japanese, or bash out an English email on my Japanese phone’s rubbish tiny keypad. It’s three days before Christmas, and I am trying to arrange a shipment of snow wheels from England to Japan. Scene two. A somewhat overwhelmed and bewildered Japanese rally crew stand in front of a muddy Honda Civic. They have just stepped out of their vehicle to chaotic scenes. A stocky man in a rally branded jacket has come over to visit them three times, on each occasion bringing a different set of trophies wrapped in a different kind of packaging. People are jostling with each other to get the best spot for shooting photos, service crew rubbing shoulders with national media and professional photographers. The team’s interpreter is trying to help the event commentator conduct an interview with the driver for the event whilst telling the crew which camera to pose for and picking up the various bits of trophy wrapping. The Japanese team truly are the stars of this rally. These two events took place two and a half years and six thousand miles apart. What started as a recommendation for a supplier of hard to obtain car parts turned into a regular business relationship, eventually culminating in the first Japanese competitors in nearly five years coming to contest a round of the British Rally Championship. My first encounter with the K’s World Rally Team was back in 2009, when my wife and I went to visit a rally in Nagano Prefecture of which team owner Kazuya Suzuki was Clerk of the Course. My first meeting with EuroRallye and their owner Iain Shirlaw came a few months later, after Ecosse Challenge competitors Colin Smith and Craig Chapman hired Iain’s car to contest the Intercontinental Rally Challenge round in Scotland. I was impressed with Kazuya’s vision and Iain’s professionalism in equal measures, so when Kazuya contacted me in winter 2010 to ask if I could help him import snow wheels at a fortnight’s notice, I knew exactly who to email. Several boxes of wheels, a number of high-quality race suits and numerous pieces of roll cage advice later, the ultimate question was asked. Kazuya wanted to hire the EuroRallye Civic for a British Rally Championship round on behalf of a customer, and the round they wanted to do was the RSAC Scottish Rally. With me acting as an intermediary, a deal was sealed, flights booked, and an entry under the name of K’s World Rally Team went in for Motoharu Kaseya and Kohei Izuno. The team would fly in to Edinburgh on the Wednesday, do seat fitting on Thursday, test on Friday, rally on Saturday, see the sights on Sunday, and go home on Monday. It was going to be an intense few days. At six o’clock on Wednesday evening I was standing at the international arrivals gate of Edinburgh Airport, holding a sign that had the legend 石田 KWRT printed on it. One of the mechanics, Ishida-san, was arriving on a different flight from the rest of the team – and having never met him before, I finally got the opportunity to be one of those people you see at airport arrivals with a sign bearing a mysterious name and/or organisation name. An exhausted man who bore an alarming resemblance to Nissan Le Mans driver Satoshi Motoyama came over to my sign – having just done a 15 hour trip and with the prospect of a 45 minute wait before he could even leave the airport, Ishida-san needed no convincing to let me buy him a coffee. The rest of the K’s crew arrived en masse about an hour later, and we proceeded to the airport rental car station and then onwards to the hotel. My alarm went off at 5am the following morning, for I had to get back out to the Airport Travelodge in order to meet the crew for breakfast. I arrived to find the hotel on the brink of evacuation, with smoke billowing out of the toaster in the breakfast room. World Rally Championship class winner and eighties Japanese rally legend Motoharu Kaseya had forgotten about the croissant he had left under the toaster seven minutes previous. Proving that rally teams the world over are identical regardless of language or nationality, an appropriate period of piss-taking and winding up followed whilst Kaseya-san attempted to salvage the remains of his cremated pastry. I was presented with four bottles of Calpis, my favourite Japanese soft drink which is neither obtainable in the UK nor describable within the confines of the English language, as a thank you for my efforts in helping the team get to the UK. The cars were loaded up, and we headed off north to Perth for the first piece of serious rally business – seat fitting at G&M Mechanical Services. SD52 DCU was on the ramps when we arrived, still bearing the awesome white and red livery it had been decorated in for its last outing on the Jim Clark. The previous sponsor stickers had been removed and replaced with those of K’s World Rally Team, and a freshly painted set of brand new Compomotives sat on the floor awaiting tyres – it had been decided the Type R looked meaner with dark grey alloys, so new wheels were sprayed accordingly. The seat fitting progressed apace, but so small was Motoharu that by the time the seat had been moved forward far enough for his feet to reach the pedals, young Scott was the only member of the service crew able to fit between the seat and the steering wheel – and even then his knees were up past the indicator stalks. Mechanics Ishida-san and Kakegawa-san also took a keen interest in the proprietors’ tool cases, photographing the spanner trays from every conceivable angle. Apparently they are not available in Japan. After a brief tour of the premises from Scott senior, we left Perth and headed off down the A9 in the direction of Glasgow and subsequently Dumfries. A brief lunch halt at Happendon Services introduced the K’s World Rally Team to proper British cuisine. Ishida-san was intrigued by the mysterious brown sauce in which his sausages were swimming, Kaseya-san discovered that if you don’t specifically ask for your pannini to be heated up it will be served to you cold with a frozen bit still in the middle, and Kakegawa-san was shocked to learn that a sausage roll means just that – a sausage in a roll with no salad, tomatoes or extras. First job in Dumfries was to pick up the recce car from the hire place before it closed at six. Messrs Kaseya, Izuno, Ishida and Kakegawa were dispatched from the Travelodge with two sheets of A4 paper and an address to put into the satnav, whilst I stayed in the hotel with Suzuki-san and his wife Michiko to prepare the documentation for the following day. Six o’clock came and went with no sign from the Dumfries contingent, but eventually the black Astra hire car and freshly-acquired Land Rover Freelander recce vehicle rolled into the car park. The reason for their delay quickly became apparent – they’d been to Tesco to stock up on food for the recce, and had filled six bags with food. By the look of things, Izuno-san planned to sustain himself for eighteen stage passes with three packs of iced buns and a two litre bottle of Irn-Bru. It was not taking that boy long to adjust to Scottish rallying. Friday started at a ridiculous hour for Motoharu and Kohei. They had to be at Clatteringshaws Forest Car Park for 7am for the recce start, so their alarms went off at 5am. The rest of us had the luxury of a lie in, before heading to the service park to see the setup. On the way, Kakegawa-san again proved that service crews the world over are exactly the same, coming within metres of wiping the pair of us out after blipping the throttle on a roundabout and shooting out in front of an HGV. At service Kazuya and Iain finally met face-to-face, and we headed out of the downpour into the G&M hospitality suite to discuss the weekend ahead. With the aid of a pad of paper and pen (which were to come in handy later in the weekend), Iain explained the importance for Motoharu of keeping out of the ditches if he wanted to avoid punctures. Kazuya then took the paper and pen and, to reassure Iain, drew a line on the diagram some distance before the bend. “This is where Motoharu brakes,” he explained. “There is nothing Kaseya-san hates more than crashing out of a rally, so he will be very cautious”. “But this”, Kazuya continued, marking a cross right on the apex of the bend. “This is where Izuno brakes because he is young and has no fear. That’s why he rolled out of the APRC Rally in Hokkaido last year. I know – I was the co-driver that day”. Ishida-san and Kakegawa-san fell about laughing at Kazuya’s recounting of the tale. “Next car up will be car twenty, a white Honda. You can talk to the crew if you want, but I wouldn’t bother because neither of them speaks a word of English. We have an interpreter down at signing-on though”. My former Scottish Rally colleague Alan Dalziel was manning the radio at shakedown with his trademark dry sense of humour, and invited us to partake of some of the Barony College’s finest buffet food whilst we waited for the car to come back round from its installation run. Over four passes of the shakedown stage Kaseya-san got the car set up to his liking, a neutral and stable setting that wasn’t going to throw him off into the scenery. We headed to signing-on, got the start time (8.21am), and hit the hay in view of the massive day that lay ahead. So nervous was I on Saturday morning that I was awake well before my 6am alarm clock. My chest felt tight and my stomach was turning. Today I’d be responsible for translating Kaseya-san’s feedback on the car into English and relaying it to Iain and the service crew. I don’t think I was even this nervous on the morning of my own nuptials – at least on my wedding day, nobody was going to be driving between trees at 100mph in a car set up based on my word. I resorted to doing press-ups and squats in my room to take away some of the adrenalin. The fact I was doing exercise voluntarily is a pretty good indication of how much I was bricking it – or kinchō shimasu as they say in Japanese. Commentator Bob Milloy nabbed me at the start to help him interview the K’s crew over the PA system, and rather anxiously asked if I’d be there at the finish as well. With the Civic safely away on the road sections to the stages, we hung around until the historics were through so that Kazuya could take some photos of the Porsches for Motoharu, then made our way to Ae for some spectating and the K’s World Rally Team’s next Scottish culture lesson: midges. The wee buggers were out in full force on account of the slightly damp undergrowth and relatively high temperatures. These were not ordinary midges, either. These were midges with tackety boots. By good fortune the KWRT polo shirts we had all been issued with out of Kazuya’s suitcase had big collars and zips that went right the way up, so with judicious use of hats and coats we were able to seal the insects out. We reached the bottom hairpin in Ae just in time to see a ferocious Renault Clio Maxi pop, scream and bang its way round the bend, and before long the wail of the VTEC was ringing through the trees. Kaseya-san and Izuno-san came down the hill in a controlled fashion, neatly rounded the hairpin and accelerated off down the road. Unspectacular but steady – and quicker, let’s not forget, than all of the people that overshot, spun or stalled in their do-or-die attempts at cornering. Just as we were figuring out that Motoharu was faster than the R1 Twingos, and therefore not plum last, Kazuya spotted something that was to make his day. A giant tail of dust was rising over the saplings at the top of the hill, a brilliant white machine exploding out of the gap in the trees. It charged down the incline at full pelt, stones flying as it locked up its wheels under braking. The driver yanked the steering wheel and hurled the car round the hairpin, the engine emitting a low growl as its four tyres reconnected with the road and propelled the vehicle onwards. Suzuki-san had just had his first encounter with Major Alan Paramore in the lead Armed Forces Rally Team Land Rover. The K’s guys were flabbergasted when I told them these vehicles were crewed by members of the armed forces. By the time we got back to service via the Heathhall spectator stage, the Type R was up on the jacks with Iain’s head in the door. The first words I heard were “we’ll wait until Leslie gets here, okay”. Perfect timing. One quick conversation with Kaseya-san later, Scott and Iain were able to set about softening the rear suspension and moving the brake bias slightly rearwards respectively. 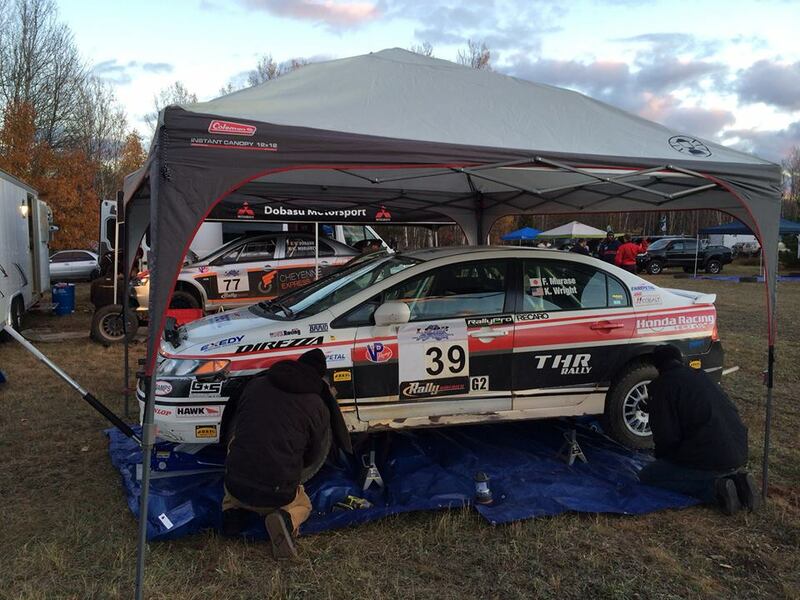 The cars settings were adjusted, mud scraped out of the wheelarches, wheels rotated and the crew sent on their way again. They’d be back again in an hour to go through the whole process again. The next two stages were a repeat of the first pair, Windy Hill and Ae. With a sense of Groundhog Day we went back to spectate, Kazuya this time cheering and clapping the Land Rovers, then raced back to service. I was relieved to see the adjustment requests I translated for the service crew had been what Kaseya-san wanted. The K’s team were taking a cautious approach, gradually building their pace and staying within their limits (although when I saw the in-car later on, I have to say Motoharu was putting in a fair old shift for someone competing in the UK for the first time). I had a chat with the driver to make sure everything was going okay and that there were no problems, at which point he broke into a massive grin and declared he was having lots of fun on the stages. With that fact established and requiring no translation, everyone was able to relax a bit and concentrate on getting Kaseya and Izuno the finish they were aiming for. Afternoon service had the potential to be the killer, though. The cars were heading to Clatteringshaws Forest for the final three stages, almost an hour’s drive west of Dumfries. The problem was that the remote service area was accessible to only one car per team – a car I would not be in. Remote service was also two miles from the road, making it impossible for the support car of Japanese speakers to walk it in the available time. In short, remote service was going to be have to be done over a language barrier. In the interim period, we had been led to believe that the K’s car had retired from the rally. Standing in the middle of the road staring at the bend round which we expected the car to appear, Kazuya and I were hit with the horrible feeling any true rallyist knows all too well – the moment when, after a long wait, the next car to appear is the car running behind yours. Oh no. I bounded over to the conveniently-placed radio car – which happened to be crewed by yet another weel kent face in the form of Merrick Stages Rally Manager Allan Marshall – and asked after car twenty. “I don’t know to be honest”, came the voice from inside the car. “Oh wait I do, they went off and had a small fire. But they’re okay”. Rubbish. Retaiya shimatta rashii desu. Kōsu auto nochi moeteshimaimashita. Off we went down the road in the direction of the stage, utterly bewildered at the thought of Motoharu being out of control enough to have an accident that resulted in a fire. Ten thousand kilometres, a great morning and then a retirement on the last loop of stages. Gutted didn’t even start to cover it. But just as we reached the Clatteringshaws junction, a distinctly un-burnt Honda came out of the stage sandwiched between two Land Rovers. It was the other car twenty – car twenty in the field for the Scottish ‘national’ rally rather than the international – that had gone off and had the fire, and thankfully the driver and co-driver of that car were okay. After a detour to Dalry for petrol, it was back to the end of Clatteringshaws to await the arrival of the ‘R at the end of the competitive action. I walked up the access road with Suzuki-san, Ishida-san and Kakegawa-san, and when we realised it was too far to reach the stop control we decided to camp out in a layby. By this time the cars were passing us one by one, Korhonen, MacCrone, Cave, and it wouldn’t be long till we knew either way what was happening. With the mist descending and Kakegawa-san and I engaging in conversation about how Japanese-style hair has a nasty habit of trapping midges (don’t ask how we got onto that), a white vehicle with a red sunstrip bearing the legend ‘KRT’ rounded the bend. They’d done it. As we fought to reach into the car and shake hands with the guys, one of the Land Rovers gave us a congratulatory toot of the horn as it passed, much to Kazuya’s delight. Next stopping point was the finishing ceremony back in the centre of Dumfries. The cool late afternoon air smelled of cheap champagne, and the announcer’s north Yorkshire tones battled for supremacy with the petrol generator that was keeping the inflatable arch upright. A white Honda-shaped blob rose over the horizon in the distance, and at exactly the same time I felt a sharp tug on my arm. DIGB. “Right, your Japanese is really going to get put to the test here”, the Ecosse Challenge founding father turned rally finish coordinator instructed me. “You need to go down there and explain to them they’ve won the Spirit of the Rally”. Excitement coursing through my veins, I raced down to the car to pass on the good news, arriving at the same moment a large black jacketed and tartan bunneted figure withdrew from the driver’s side window, the page on his notebook nearly blank. “I got punctures and no more than that. I’ll just wait for your press release, okay!” Kaseya and Izuno had just had their first proper encounter with legendary Scottish rally scribe John Fife. Apparently they don’t teach Scots in language classes in Japan, let alone New Stevenstonish. Once the British Championship ceremony had been concluded, the Honda was summoned forwards and the chaotic scenes I described at the start of the story unfolded. What the K’s World Rally Team had actually won was the Bandeath Trophy, a historic award presented annually to the person or people the rally organisers deem to be the Star of the Rally. For someone on their first trip to Europe to stay out of trouble, beat two cars and have a damn good go of it – as the in-car I saw attested, they certainly weren’t hanging about – the ‘Star of the Rally’ accolade was very fitting indeed. At this juncture I’d like to get serious for a minute and give a big shout out to EuroRallye, G&M Mechanical Services and Andrew Wood Motorsport. It was their combined thinking to put two spare wheels – one more than normal – in the boot of the Civic on account of the high probability of punctures on the rough Dumfries and Galloway forest roads. This smart thinking probably kept Motoharu and Kohei in the rally, because in the seventh stage they hit a big rock that had been dragged out and punctured both right-hand tyres. With two spares they were able to continue on their way, make it to the end of the rally and collect both the class award and the Star of the Rally Trophy. A fabulous reflection on the professionalism and attention to detail of all involved in the car’s preparation. I woke up the next morning with a splitting headache. Not on account of excessive alcohol, but out of sheer relief that the K’s team had made it to the finish and had a good rally. A relaxed day of sightseeing followed, during which the Nagano team members photographed the scenery, pretended to fire cannons at Edinburgh Castle, ate haggis and drank whisky. By 5pm I’d had three drams yet perversely my headache had disappeared. The most satisfying moment of all was getting back to the computer, opening up the memory card on my camera and looking at all the photos on Facebook. For there was photo after photo after photo of Motoharu, one of the most gentle, humble and modest people I’ve ever met, unable to take his eyes off his giant Mario Kart-style Star of the Rally trophy. I don’t know what the Japanese translation for ‘dog with two tails’ is, but it’s weekends like this and the Jim Clark experience with the Australian Targa crew that have really helped to restore my enthusiasm for motor sport over the last few months. The Japanese rally crew of Motoharu Kaseya and Kohei Izuno battled the weather, the rocks and the midges on their way to a fine finish on Saturday’s RSAC Scottish Rally – and were rewarded with one of Scotland’s historical motor sport trophies for their efforts. The pair received the Bandeath Trophy at the finish of the Dumfries-based rally in recognition of their endeavours in the EuroRallye Honda Civic Type R.
The Bandeath Trophy is awarded annually to the ‘star’ of the RSAC Scottish Rally. This is a person or group of people whom the organisers of the rally – itself among the oldest motor sport events in Scotland – feel most appropriately conveys the spirit of the rally. 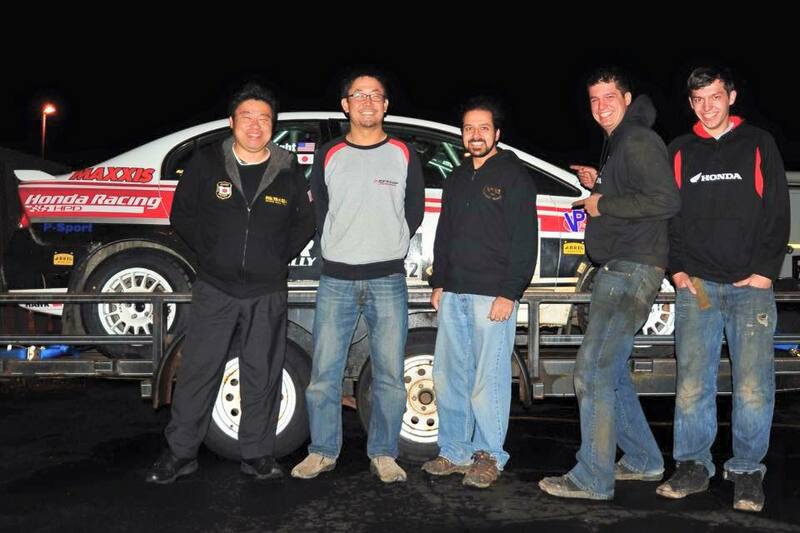 This year K’s World Rally Team members Kaseya and Izuno were chosen in light of the (literal) great lengths they went to in order to take part in the Scottish, traveling several tens of thousands of kilometers just to reach the start venue before tackling the rally with good humour, much friendliness and great enjoyment. Spectators, marshals and other competitors alike were delighted to see the red and white Honda arrive at the final time control, covered in mud but with the crew in the cockpit beaming as they had done all day. Motoharu and Kohei were driving competitively, though, and put in a respectable performance against many of the British Rally Championship’s regular competitors. Rallying in Europe for the first time, they set out with the aim of getting to the finish and soaking up the experience along the way. With Motoharu, an occasional participant in World Rally Championship and Asia-Pacific Series events, slowly adapting the car’s settings to his driving style, they gradually upped their pace throughout the day whilst staying out of trouble in the changeable conditions. 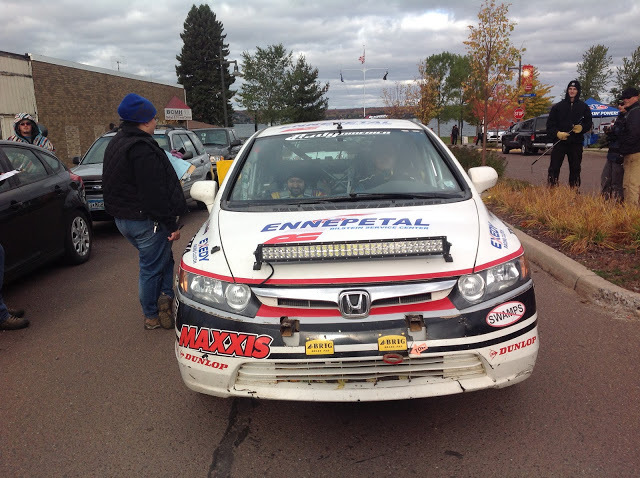 A double puncture towards the end of the seventh Shaw Hill stage was the only major drama the Honda pair had to battle. They hit one of the large, sharp rocks that have gained notoriety among rally crews in this part of the country, puncturing both right-hand side tyres. With the rear tyre losing air immediately and the front going down more slowly, they had to deploy both of the spare wheels EuroRallye had placed in the car on account of the rough conditions. Wheels changed, they were back on their way with minimal time loss. “Although I have competed in New Zealand, this was a completely new and different experience for me”, added Nagano co-driver Izuno. “Even though I am usually a driver myself, doing a big rally as a co-driver is a very good way to get experience about working as a team and understanding how the car is set up”. The 2013 RSAC Scottish Rally was held in Dumfries and Galloway on Saturday 29 June. A round of the British Rally Championship, the Scottish took place over seventy miles of south-west Scotland’s forest roads, with the event start and finish in Dumfries. Over 130 crews took part in the Scottish, including those from as far afield as Finland, Norway and – of course – Japan. In the high-octane world of rally driving, Japan is renowned more for its cars than its drivers. Mitsubishi, Subaru and Honda roll off the tongue much more readily than the names of pilots like Arai, Nutahara and Tajima. But the island nation’s rally competitors do have a strong track record of competing overseas – a tradition Motoharu Kaseya and Kohei Izuno will continue when they start the RSAC Scottish Rally this coming Saturday. It has been over ten years since a Japanese crew entered Scotland’s flagship motor rally, which has been running since 1932. Despite a very strong grass-roots following, rallying in Kaseya and Izuno’s homeland has a relatively low public profile – Motoharu’s hometown of Shonan is better known as the Japanese capital of surfing, and Kohei lives in the shadow of the Olympic ski-jump in Nagano. 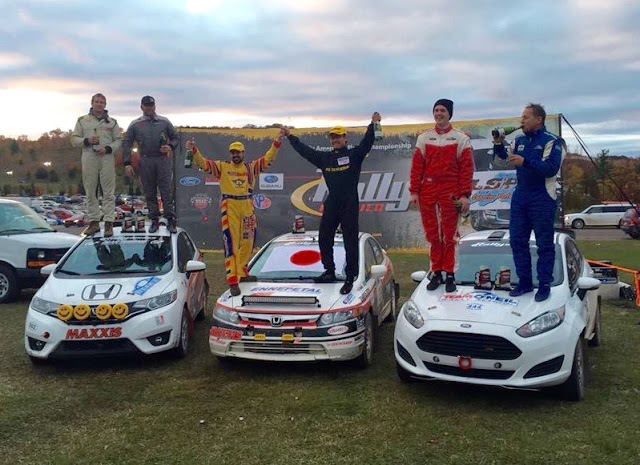 Both accomplished drivers in their own right, Kaseya and Izuno actually fought as rivals on last year’s World Championship round in New Zealand, the latter winning the battle for supremacy on the stages on that occasion. For the trip to Scotland, however, Kohei will pick up the pace notes as he looks to help the K’s World Rally Team – of which both he and Motoharu are members – score a good result on their first sojurn to Europe. The K’s World Rally Team has competed successfully at a high level in Asia, Africa and Australasia, and for the trip to Scotland they have entrusted car preparation duties to Lancashire-based EuroRallye. It is EuroRallye’s Honda Civic Type R that the Japanese crew will be piloting over the seventy miles of Dumfries and Galloway forest stages that make up the Scottish Rally. The RSAC Scottish Rally takes place on Saturday 29 June. It is a counter in both the British and Scottish Rally Championships, featuring seventy miles of action over nine special stages. Competitors from Norway, Finland and Sri Lanka will be among those taking on the K’s World Rally Team for honours. Japan and Australia are leading the race to become the first two countries to qualify for next year’s World Cup – but football isn’t the only sport the two nations’ athletes are neck and neck in. Hot on the heels of the Australian Redback Racing team, it’s now the turn of the K’s World Rally Team from Japan to get behind the wheel of the EuroRallye Honda Civic Type R.
Driver Motoharu Kaseya and co-driver Kohei Izuno will contest the RSAC Scottish Rally on Saturday 29 June, the third round of the British Rally Championship. The pair are both accomplished drivers in their own right, having taken separate class wins on last year’s World Championship rally in New Zealand. Now they have their sights set on success in Europe, and are coming all the way from Japan to take part in the Dumfries-based rally. Thankfully, they won’t have to take their own car with them. Although Motoharu and Kohei are doing the rally in a Japanese-specification Honda, the car has a somewhat shorter journey to make than its crew. It only has to make a short hop down the M74 from its garage in Perth, and will be ready and waiting for the crew when they touch down on Scottish soil. On the Jim Clark Memorial Rally at the start of this month, the very same Civic scored a class win in the hands of Australian Targa crew Adam Spence and Erin Kelly – and EuroRallye boss Iain Shirlaw will be hoping for a similar result this time out. “I very much enjoy challenging myself on international rallies, and after doing well in New Zealand last year I was keen to try something different”, explains Kaseya, who hails just a stone’s throw from Kamakura – home of the first Japanese samurai. “Our team principal at K’s has done a lot of good business with EuroRallye, so he suggested we go to Britain and do a rally with them”. The Scottish sojurn means K’s World Rally Team – run out of the mountains of Nagano by Japanese championship-winning co-driver Kazuya Suzuki – will soon have competed on four different continents, adding Europe to Asia, Africa and Australasia. “I’ve never been to Europe to rally before, and have only seen the stages on the internet”, Motoharu continues. “I think the Scottish forest roads are quite similar to those in Japan, and I am looking forward to experiencing Scotland as well as having an enjoyable rally”. The RSAC Scottish Rally will be held in the forests of Dumfries and Galloway, taking in 73 stage miles over the course of one day. Previous winners of this historic event include World Champions Colin McRae, Ari Vatanen and Hannu Mikkola. Motoharu Kaseya and Kohei Izuno will also be the first Japanese competitors to enter the Scottish Rally for over a decade, the last such entry being back in 2002.